I’ll admit it, I never really understood the point behind a bunch of people walking for a cause, no matter the purpose. For all I knew, it was about raising money, and that I understood. I believed that people wouldn’t donate unless they had something to do or to gain. I figured a walking event was the easiest thing these organizations could think of to do in order to raise needed money for therapies, finding cures, etc. ; that made sense to me. So I donated, but I never walked; and I’m ashamed to admit that. Because now, I get it. 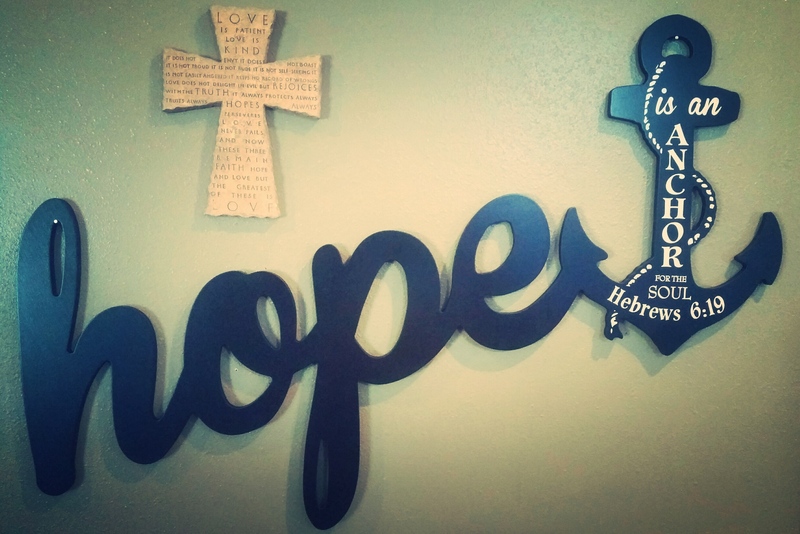 It may be about raising money, but it is also about raising hope. It is about being surrounded by others whom have fought a similar battle and won, or at least understood the pain. It is about knowing we are never alone. We will walk this Friday, September 11, 2015…exactly six years after the first time Jeremy tried to take his life. We are healing via walking. On September 11, 2009, I arrived home from a normal day at work; except it was anything but normal. I fought myself all day that day; I didn’t believe I should have left my husband, Jeremy, at home alone. Jeremy had been diagnosed with severe depression that past May, and he seemed to be steadily losing his passion for life. There was less light in his eyes by the day, but it was easier for me to ignore my fears and believe him when he told me he was “fine.” He wasn’t fine. But what would the world think if they knew the truth? So we both ignored it, and it tore us up. But that day, we couldn’t ignore it anymore. Jeremy had been locked in an intense battle between himself and his brain all day long. His dark thoughts almost won. Years later, and after five suicide attempts, a near-death car accident likely caused by a medication failure, countless medications we flushed or adjusted, and a trip to California to allow Jeremy access to cutting-edge technology in order to actually see what his brain was doing to him, we are survivors. We are supporters. My husband fights depression every day, but the healing and understanding we have all found, including family, friends, and supporters, has been incredible. Jeremy’s symptoms are under control for the most part, and he readily accepts help. He understands his illness. But most importantly, Jeremy understands the fact that his illness is the best thing that ever happened to us. Depression led us to God; it led us to our purpose. Our purpose is to support and help others find the hope that we found. I would like to share with you an excerpt from our book. We knew what we had to do, so we shared our entire truth. 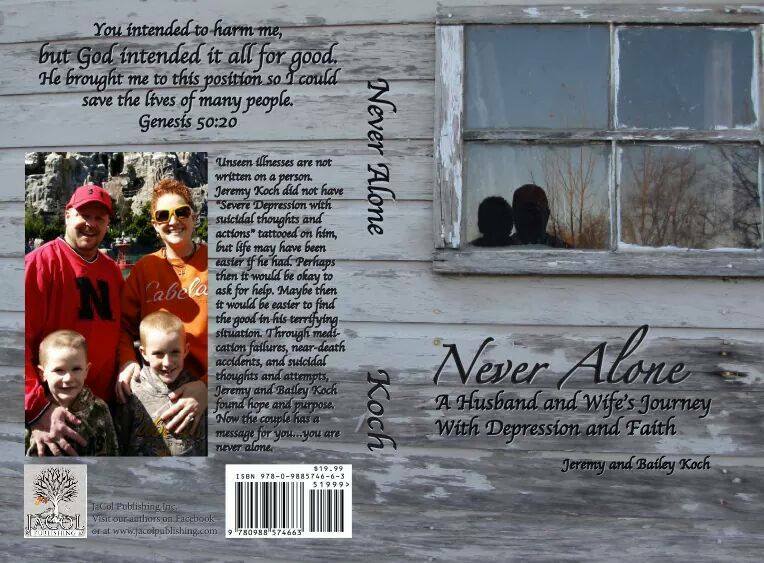 “Never Alone: A Husband and Wife’s Journey with Depression and Faith” was published by Jacol Publishing in April of 2015. I remember thinking to myself, “You won’t go grab the shot gun in your gun closet.” It was as if a challenge happened within me. Making fun and putting myself down was, and still is, easy to do. I beat up on myself constantly; I’m my own bully. And this day would turn out to be a pretty tough fight. I rose from bed and slowly walked over to the gun cabinet, feeling an extreme desire to stop the thoughts, no matter what it took. I understand now that a suicide attempt is not somebody’s desire to end his or her life, but rather an intense longing to live fully and completely. My grandfather’s hand-made, wooden gun cabinet was the “safe place” for me to store the three guns I have in my collection. I grabbed my black, twelve gauge, Benelli shotgun; the metal felt colder and heavier than it ever had before. I sat on the edge of the bed and remember feeling amazed I had the guts to make it this far. The voice inside my head spoke up as I lay on the floor with tears streaming down my face. “You won’t grab a shell and load it in the gun.” I needed to stop the thoughts racing in my brain. With determination I walked back into the dark bedroom, grabbed the twelve-gauge again, and popped a shell into the empty chamber. I sat on the corner of the bed and thought about where I wanted to be found. Not wanting to end my life in the bedroom I shared with my love, I walked into the office and sat in my chair at my desk. Thoughts of Bailey and the boys entered my mind long enough for me to decide they would be better off without me. I leaned the loaded gun against my desk and distracted myself with email. This might sound like a random thought; but I know now God walked with me through this terrifying ordeal. He fought to help me see my purpose. I clicked on “compose” and started an email to Bailey. I began the email with “Come home if you can” when my eyes welled up with tears and I could no longer see the computer screen. As I sat there, the terrifying thoughts grew louder again. “You won’t hold that gun to your head and take the safety off!” I grabbed the loaded gun, more than ready to silence the thoughts, placed it under my chin and un-latched the safety. Placing my index finger on the trigger, I closed my eyes. This was it. I still struggle with this painful memory to this day and know I will forever. As tears ran down my face, I had a vision. I saw Hudson, our oldest son, standing in the white-framed window of his daycare that morning. He waved goodbye. I dropped the gun and fell to my knees. God had to work hard to win the battle for me that day; I wasn’t strong enough without Him. But He won. He showed me my purpose with a vision that will forever be etched in my memory. The rest of the day is a blur. I ended up putting the safety back on, unloading the gun and placing it back in the gun case. I fought through the constant onslaught of suicidal thoughts until Bailey arrived home from school. I remember sitting on the edge of the chair with my tearful head in my hands while telling Bailey the PG version of what had happened that day. She immediately recognized I needed help and drove me through the rain to the mental health hospital in Kearney; a quiet trip that went by quickly. The long day of fighting had exhausted me and I knew I needed help. Upon arriving at the hospital, a nurse, Bailey, and I sat in a small white room with pamphlets titled things like, “So You’ve Thought of Suicide” and “When the Voices Won’t Stop.” The nurse asked me to discuss my issues. I asked Bailey to leave the room because I wanted to protect her from the wretched truth of my day. Bailey stepped out and I unloaded the real version of what had taken place. I told the nurse I would be fine and wanted to go home, but she knew that wasn’t going to happen any time soon. Then it was official, they committed me. I was a danger to myself, and even I knew it. The staff began the intake process for new patients while Bailey sat, trying hard to be strong. But I still didn’t see her, not really anyway; this was all about me. This was happening to me. I felt all alone. Even though Bailey sat beside me and refused to leave my side until they made her. In removing my belt and shoelaces, I thought to myself, “What in the hell are you doing here? You don’t belong at a place like this!” I walked around in my socks and judged others in the hospital. I believed I was unique and didn’t need to be here; I was better than this. Two of my first visitors were my dad and father-in-law. The two men rode together from home in complete support of one another and of what they wanted to do to support us. As they walked in, I leaned against the wall with my arms crossed. I looked at them and said, “I don’t belong here. The people here are crazy!” I terrified both of them with that statement. They knew I needed to be there for some serious help. My eyes had lost the light. But for now, because I got in the car when Bailey said it was time to get help, I was safe. Jeremy is safe still. And while what you just read was not easy to live, we understand now there are many more who live it. Jeremy survived many more days similar to this before we found our hope; God never gave up on us. There are countless people who live in silence, in fear of being open about their own realities. So we will walk to show there is hope. We will walk to support Jeremy and all those living with mental illness or trying desperately to support someone or cope with the loss of someone. There is a lot of healing that comes in understanding the reality of the illness and especially in understanding that none of us are ever alone. We support mental health awareness because we live the reality. Hudson (right, age almost 9) and Asher (left, age 6) know the reality of almost losing their daddy many times. The truth continues in our home; our boys will walk with us. Please join us. Please walk with us in support of mental health awareness and suicide prevention. The very place, the safe place, I brought my husband to on that night six years ago is sponsoring this walk for hope. It is impossible to express my thanks to them. Richard Young Hospital was part of the good that God had placed in our lives to help Jeremy find hope in his illness. So on September 11, 2009, we felt defeated. But our journey toward hope and healing began. And this Friday, on September 11, 2015, exactly six years from the first time Jeremy tried to take his life, we will walk as living examples that life goes on and healing happens. We overcame battles we never asked to fight. We found hope. We found faith. We found out who we really are and why we are here on this earth. Please walk with us in Kearney on Friday, September 11, 2015. Light Up the Night for Mental Health Awareness and Break the Stigma! 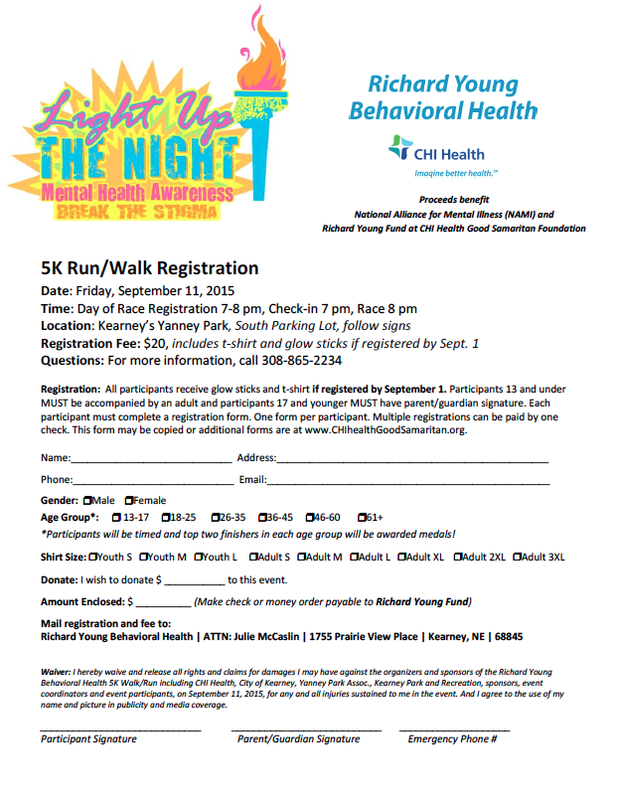 Registration begins at 7:00 pm on Friday, September 11 and the walk begins at 8 at Yanney Park. 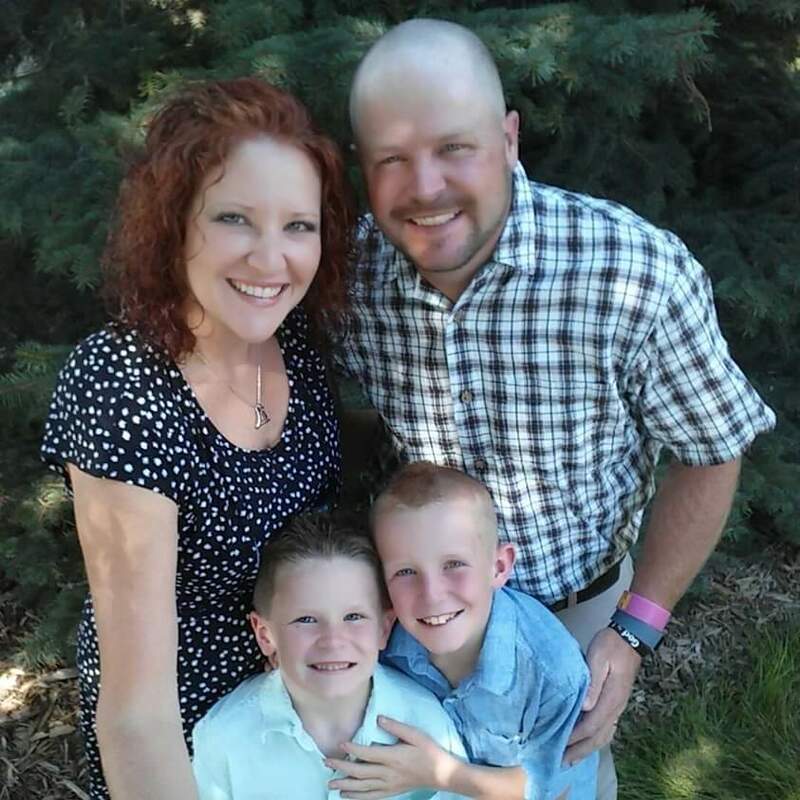 Learn more about us, Jeremy and Bailey Koch, on our website. There, you will find links to purchase a signed paperback copy of Never Alone directly from us. You can also purchase the Kindle version on Amazon. Thank you so much for your never-ending support. God bless.